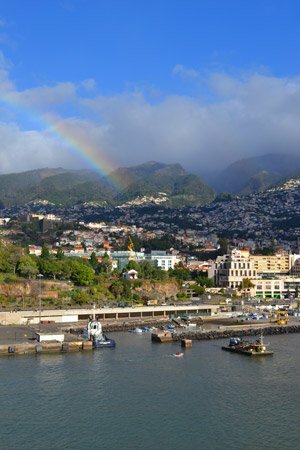 Our Funchal cruise port guide gives you information about the docking location, cruise dock, transportation options and much more! 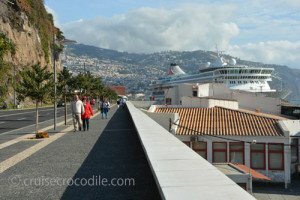 Welcome to the Funchal cruise port guide. The small city of 110.000 inhabitants is the capital city of the beautiful island of Madeira. This destination was even recently chosen as one of the best islands in the world by Tripadvisor. This is a title is holds up to. It is a little bit of Portuguese paradise in the middle of the Atlantic ocean. Madeira is known for a lot of things, the travel guides will tell you it is the island of flowers, but it is so much more than that. The unique and rare thing about this destination is that the landscapes are changing every 5 minutes. It is unbelievable what climates and scenery one tiny island like this can hold. In Madeira you’ll find the luxurious mountain slopes, rain forest and treeless moorland all side by side in just a few minutes drive. That makes it a gem to explore and we think this is without doubt something you should take advantage of. The capital is Funchal where the ship is going to dock. Funchal is the perfect spot for a day where you can enjoy the beautiful flower gardens and local traditions. It has everything you could ask for in a destination. Make sure that if you cruising this part of the world Funchal is on your itinerary. There are several cruise docks available in Funchal. 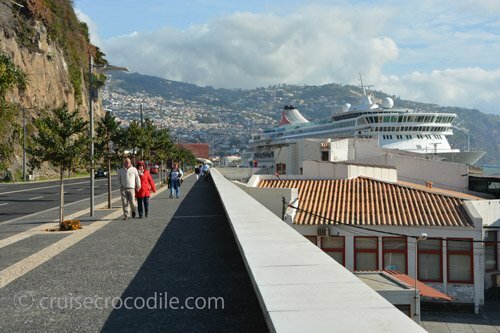 Cruise ships dock within walking distance of Funchal city center. There is a cruise terminal with welcome center at the dock. There are plenty of taxis at the cruise dock. There is a hop on hop off bus, but it doesn’t come to the pier. Your cruise line might provide a shuttle service. There are several places where the ships can dock. See map for the options. Normally the ships dock on the large finger pier, although ships can also dock on the town side. 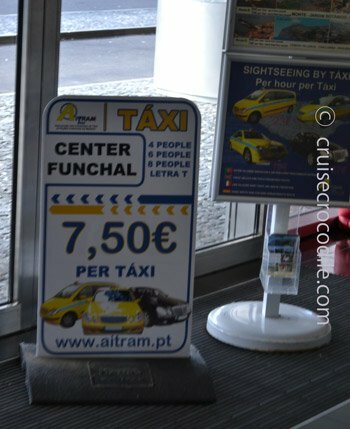 Although the taxis in Funchal have a meter it is clearly advertised what the taxi prices for one way to the city centre and what the taxi prices for tours are. See here to the left what these prices are. This is the view you’ll have from the higher decks of your ship. We can’t guarantee the rainbow. From this you can already see this island has a lot to offer. From the big city to the its colourfull hill tops with weather that changes every 5 minutes just like the landscapes do. Funchal has several docking locations. There is one spot less than 1 km walk from the city centre, however this is usually where the smaller ships dock. The other docks lay at the southern finger pier you also see on the map here. From here it is about a 2 km walk to the city centre of Funcha. 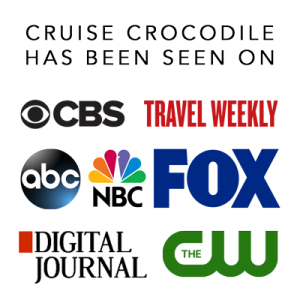 Check with your cruiseline if they will offer a shuttle bus. Funchal offers quite some options on how to get around. It has a large public transportation system, taxis and hop on hop off services. The official taxis from Madeira are yellow with a blue stripe and they do have a meter. The taxi prices are on display at the cruise terminal and in town. You’ll find that the fixed price from port to the city centre is 7,50 euro. The taxis of Madeira are also suitable to tour you around. Expect the following prices: Camara de Lobos – Cabo Girao – Pico Barcelos – Eira do Serrado = 80 euro for a taxi up to 4 people and 96 euro for more than 4 people. Funchal also offers hop on hop of busses. They are not able to come to the pier, but they will send their representatives over. Aks them where to pick up the bus. This location will probably be about a 1,5 km walk or a 7,50 euro taxi ride. The nice thing about this service is that it goes further than the city of Funchal. They go along the coastline as well even towards Camara de Lobos. Public transport in Madeira is a really nice and cheap way to go. A day ticket for public transport will cost you just under 6 euro. Single prepaid ticket 1,35 euro and on board ticket 1,95 euro. The tourist information has printed suggested routes to take with public transportation. There a lot of hikes on the island. Most of them are on the Levada’s. These are irrigation ditches created by the slaves in the 15th and 16th century. It was created to get the water from the wet to the dry areas. Today these Levadas have become hiking paths. You need to plan a hike like this ahead and it is wise to contact the local tourism information for the latest updates on them. Other than the regular ways to go you can also opt for a tuk tuk ride around Funchal. Or you could join the Santa Maria de Colombo ship for a nice scenic sail in the area. This is the best street of Funchal. This street really gives a feel for the unique style of Funchal and there is always something to do here. Every event, ever market will take place here on this street and therefore it is one not to be missed. This is the Funchal cruise dock. It is located in front of the city. 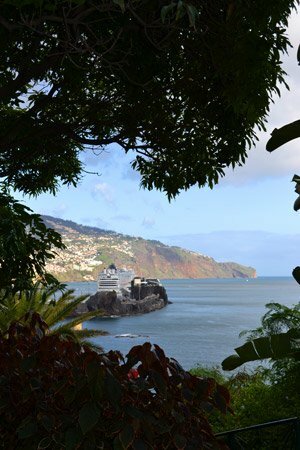 Read about your arrival in the cruise port Funchal in our cruise port guide here. This is without doubt the highlight of Funchal. If you take the cable car up, why not take the basket down. These gentleman in traditional clothing make sure you’ll have the thrill of a life time. Pay cash or by card. This is the 2nd highest sea cliff in the world at 570 meter. At the sight they have created a viewing platform with partially glass floor. It is a unique sight to take gorgeous pictures. If you are interested in history and culture than this is the mandatory stop in Funchal. This museum will tell you all you want to know about the vulcanic eruptions, indigenous plants, the famous explorers and much more. The cable car from Funchal goes up to Monte. This is a tiny village on top of the hill at about 700 meter above sea level. You’ll find the Igreja de Nossa Senhora do Monte, Jardim Tropical, Quinta do Monte and Largo da Fonte here. The official taxis are yellow with a blue stripe and they do have meter. There are some fixed prices that they established for themselves. Find the taxi prices in the port information. The cable car is the way to get higher up and visit the town of Monte. It is a spectacular ride that will take you to 560 meter altitude within minutes. Take it one way and perhaps take the basket ride down. The old workers market is the perfect sight to visit to get acquinted with the local fruit and vegetables. This market is open from Monday to Friday and Saturday’s just int he morning. 19 km from Madeira at an altitude of 633 meter you will find the hidden village of Curral da Freiras. The name Nun’s valley comes from the nuns who escaped Funchal through a secret, narrow footpath into the valley where they hid from the French pirates who invaded Madeira. The only road going to the village was made in 1959. It twists and turns through the valley and the scenery is amazing. This colorfull fishing villages lies 10 km from Funchal. If you want to enjoy the beautiful landscapes and visit a unique little bay that displays local life this is the place to go to. Reach it by taxi, hop on hop off bus or local transportation. At the top of the cable car you will find the Monte Palace Gardens. Koi fish, orchids, ceramic art work and mesmarizing views in abundance. This is a garden not to be missed. This is one of the oldest remaining structures of the island. This Gothic cathedral was build in the 15th century. It is still the eye catcher of the city centre. The inside is adorned with a silver processional cross and a cedar wood Mudéjar design. This is the street that marks the old town, although the reason you want to visit this street is because of the very unique collection of doors that they have here. See one example in the picture, but find many more in the Rua de Santa Maria.